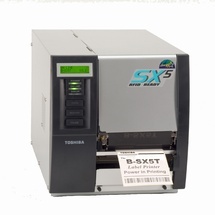 This competitively priced high output (30,000 labels per day) industrial printer offers a print width of 5 inches at an 8 inch per second print speed with 300dpi print quality. Featuring ribbon save as standard, media costs are kept to a minimum, which, coupled with the minimal repair and recovery costs, ensure a lower total cost of printer ownership. Supplied RFID ready (13.56MHz once the RFID option is purchased separately), and with BCI (Basic Command Interpreter to enable connection to existing legacy print systems), this printer offers the user future proofed printing. TOSHIBA TEC B-SX5 is ideally suited to any high output application. TOSHIBA TEC has retained all the proven features of the very popular B-572 printer, whilst providing the latest technical innovations in functionality and performance. Constructed from heavy-duty steel.